Jewellery and watches are often acquired to mark a special occasion in our life or inherited from family or friends. They are amongst our most treasured assets but the value and portability of jewellery and watches makes them inherently vulnerable to damage, loss and theft. It is important these items are considered carefully as part of your contents insurance and that your jewellery is not underinsured. 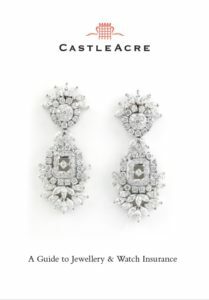 How Can Castleacre Protect Your Jewellery? We take the time to understand your lifestyle and find out how you want to use your jewellery. As an independent private client broker we offer an unbiased review of you existing contents policy to help you determine if you already have the right cover in place. If we recommend a change of insurer or policy it is solely based on your personal requirements. For example if you want to wear you jewellery or watch with relatively few restrictions the best option would be worldwide all risks cover; Alternatively for an inherited family jewel, which you only wear occasionally the most cost effective solution might be a policy with some restrictions on wear but cover for the piece while it is stored in an approved safe. Jewellery can be particularly susceptable to changes in value and many people are rightly concerned about underinsurance which is why we recommend regular professional valuations.